This page is on Fractions for Pharmacy Techs. 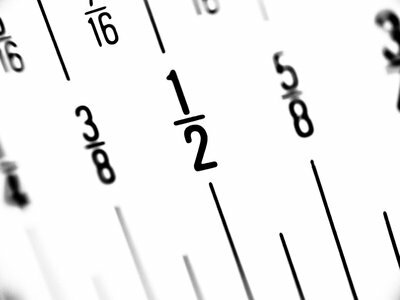 Understanding fractions is an important skill when you're working as a Pharmacy Technician. We're going to go over some quick guidelines that will help you remember how to work with fractions and convert fractions into decimals. When you're looking at a fraction, the number on top is called the numerator and the number on the bottom is the denominator. In this case, to find a common denominator we multiply them by the other denominator. So we're going to multiply 1/4 by 3/3 and 1/3 by 4/4. Subtracting fractions works the same way. We simply subtract the numerators as long as the denominators are the same. If the denominators are different, we use the same process as above to find a common denominator and then subtract. These are all ways to write one-half. But 1/2 is the simplest form of this answer. To reduce a fraction, simply factor out the same number from the numerator and the denominator. If the numerator is 1, it cannot be reduced. If you ever get confused when looking at a fraction that you need to do math with, just start with the first step and do everything slowly and in order. When you're done, double check your work for basic logic. For example, if you're adding 1/2 and 1/4, you know that the final answer needs to be less than 1 but greater than one-half. So 3/4 or .75 passes our logic test and is also the correct answer. Fractions are much easier when you take each step in order and take the extra time to double check your work.